Yet more Spoiler-y goodness arrived on the internet this week, and this time it was for the Guardians of the Galaxy set. It’s nice to see some affiliations whose current roster is a bit thin on the ground get a boost, especially when I am in a local community where Single Affiliation theme events are very popular. The addition of some new ‘Marvel Knights’ is a welcome surprise, and I’m pleased to see SHIELD, The Avengers and (of course) the Guardians of the Galaxy themselves get some interesting stuff to play with, particularly in a Golden Age context. This one stood out to me, and I anticipate lots and lots of fun team potential with this card. This card, in essence, will make any team of you favourite characters a potential win con, and really takes us back to some old Skool thinking around dealing twenty points of damage with good, old fashioned Combat damage. Takes me back to the good old AvX days when I was regularly trounced by ‘Spider-Man – Webslinger’ teams. I’m looking forward to trying a few Modern Age teams with her. For example – get a ‘Justice – New Warrior’, ‘S.T.A.R. 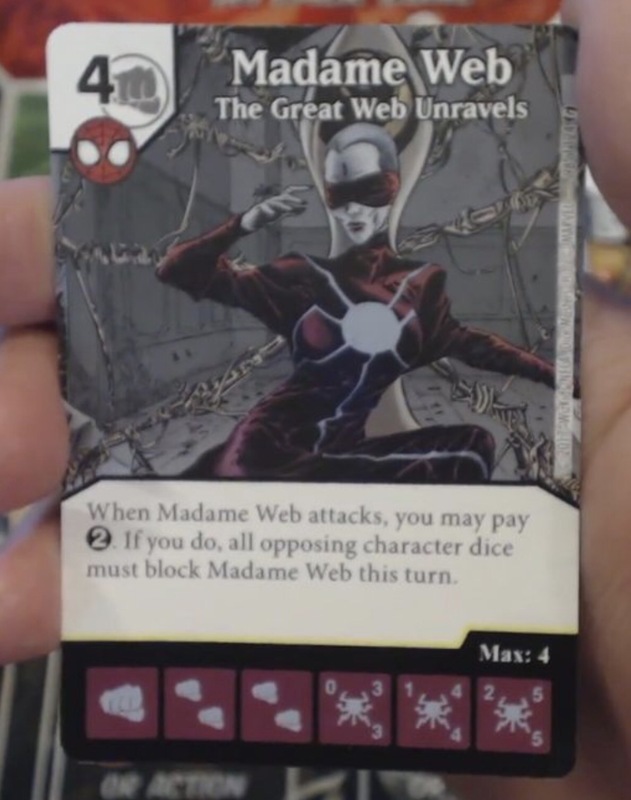 Labs’ global, and this ‘Madame Web’ on a team and you’ve got a pretty scary, low cost team that can deal some damage mega-quick. Or perhaps drop her into a ‘Foot Ninja – Ninja Syndicate’ Ally/Sidekick team to fill the void left by the rotated out ‘Falcon – Recon’. She’s also going to be a dominant force in Draft – she is undoubtedly going to be one to look out for, and will have some devastating potential. I’ll crack a smile if a draw this card in a draft. This one probably won’t be all that strong in practice as it seems on paper right now, but it sure seems like an interesting game-text to have a play around with. 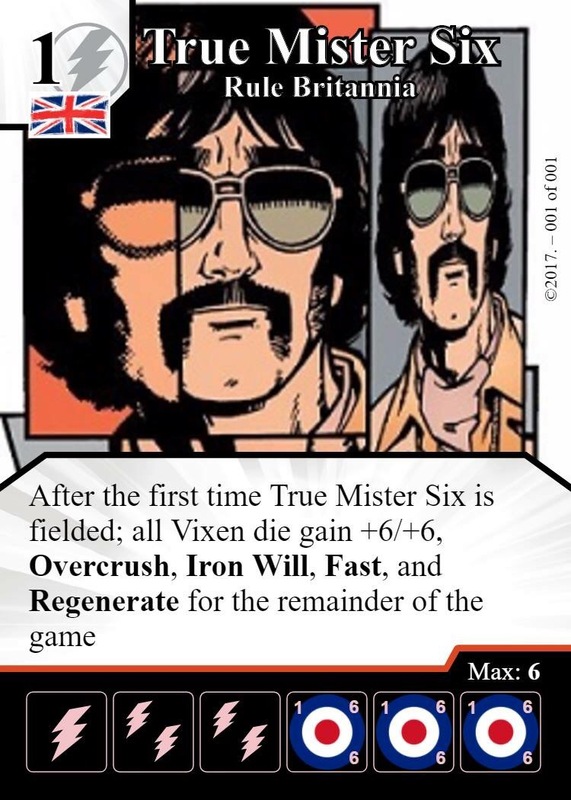 He would certainly be a good counter to teams that are weenie blocking with cards like ‘Alfred – MI-5’. I’m always interested in trying out cards that help me get to my dice quicker and, while this card is limited in comparison to ‘Rip Hunter’s Chalkboard’ Global when looking at Constructed, I will certainly be coming back to take a closer look at this guy for a potential draft pick once the full set is known and I can see whether a ‘Hydra’ draft build is viable. We’ve only seen a handful of GoG ‘Villains’, and what we have seen is mostly the expensive stuff that you would likely not be able to afford with one extra energy to take advantage of this game-text. 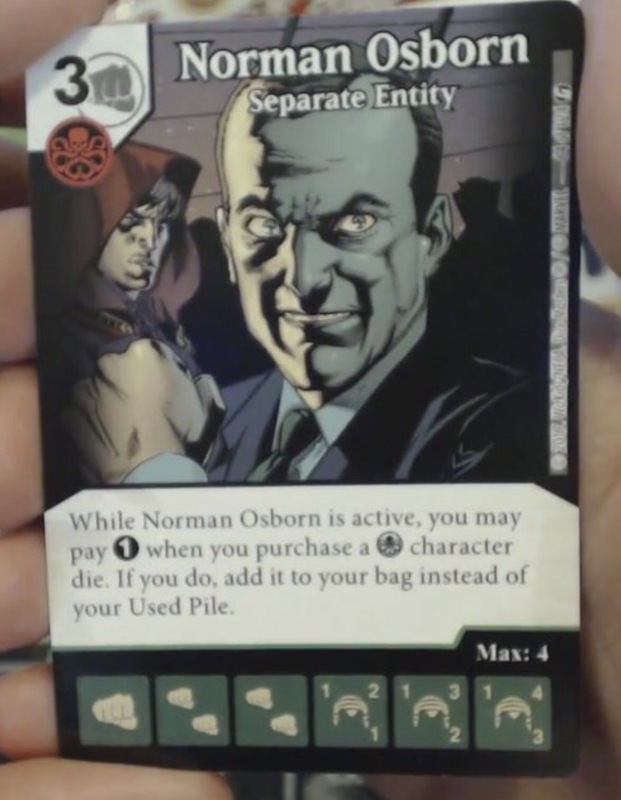 With Modern Age versions of ‘The Outsider’ and ‘Villainous Pact’ a ‘Villain’-centric draft team has some pretty good ramp & churn support, providing there are some more reasonably costed ‘Villains’ (especially Common or Uncommon) that might pair well with ‘Norman Osborn’ in draft. So while it’s caught my eye I’m tentatively reserving judgement until I’ve seen more, but am hopeful there’s some fun to be had with this guy. “When fielded” effects aren’t quite a strong in Modern Age, but there is stills lots of compelling synergies to be found, and in the Golden Age format this could be insane. 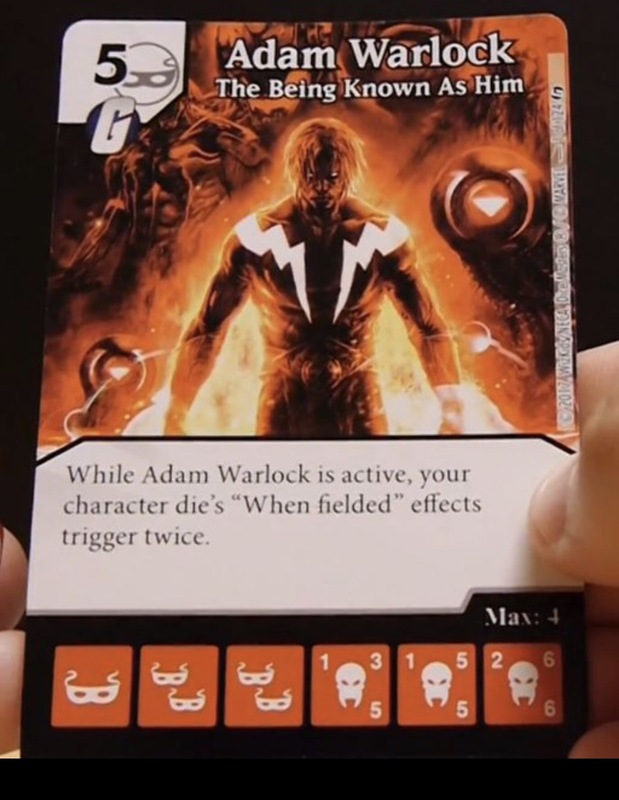 I’m already toying around with a few plans for this ‘Adam Warlock’ in just the short time since I’ve seen it. One thought that immediately sprung to mind was getting him paired up with the Rare ‘Firefly – Watch the World Burn’, mostly because he’s another new card I’ve been planning on building a team around and he’s at the forefront of my mind. The possibilities are really juicy with this guy – double up your ‘Intimidate’ cards, shoot twice with ‘Huntress’/’Green Arrow’/’Hawkeye’, set your ‘Deathstroke – Weapon’s Master’ off two times over, go wild with a double-whammy ‘Storm – Windrider’ or, most insane of all, blank two characters with a single ‘Shriek – Sonic Beam’. And that’s just to point out a few combo prospects with him I can name off the top of my head. Going to love seeing what can be done with this guy. There we are then. 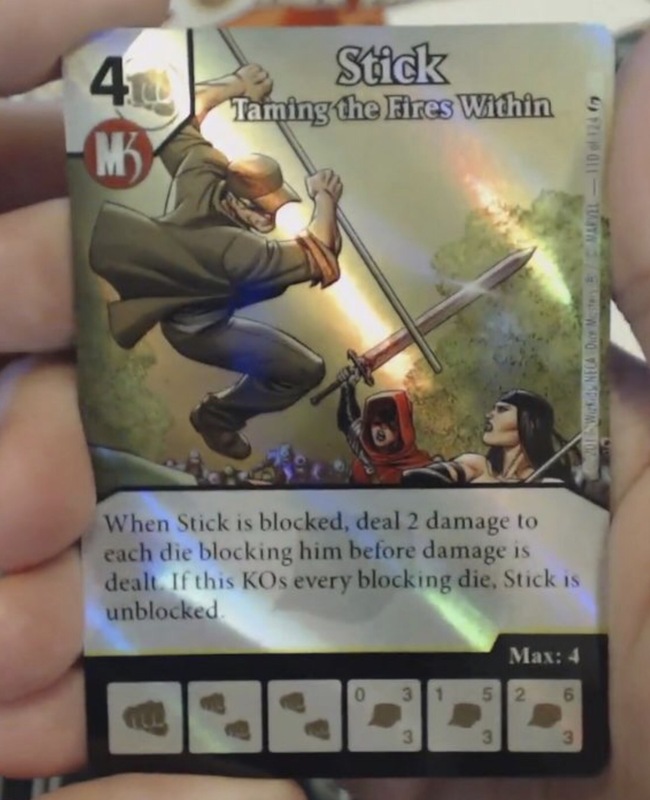 With just a small selection of spoilers already some key highlight cards. It’s looking like a set with a lot of promise and can’t wait to see more previews of the set coming down the pipeline.